Screen printing is a printing technique that uses a woven mesh to support an ink-blocking stencil. The attached stencil forms open areas of mesh that transfer ink or other printable materials which can be pressed through the mesh as a sharp-edged image onto a substrate. 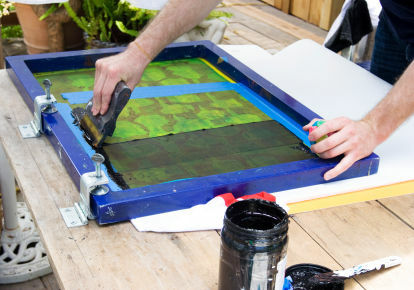 A squeegee is moved across the screen stencil, forcing ink into the mesh openings and onto the material being decorated. In order to create multiple colors on a substrate, a number of screens can be used to produce an image with multiple colors.